Give a festive hug that lasts on this bespoke Chilli and Bubble's wooden cheeseboard. This quality wooden board will be a valuable addition to a kitchen and makes a quirky Christmas gift for a family or friend at this time of year. Made from beautiful beech wood the board has an integrated set of mini cheese knives. 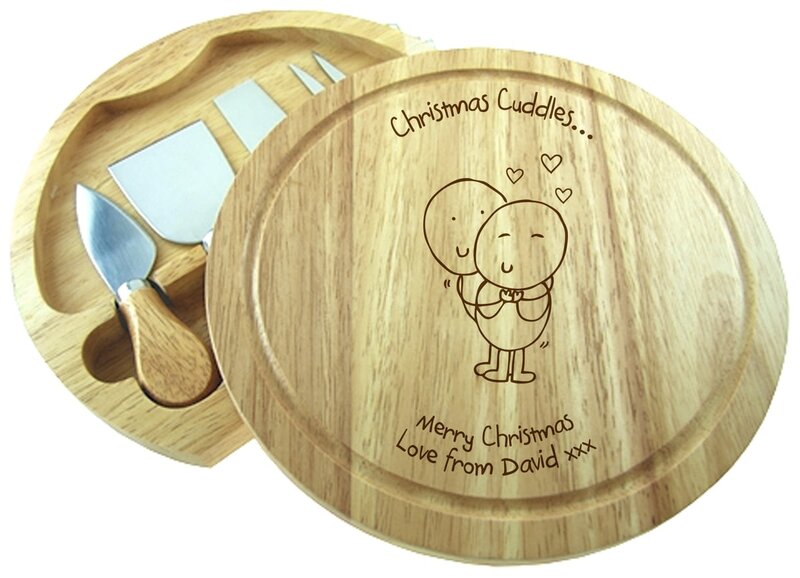 With a cute Chilli and Bubbles character in the centre, and your message engraved into the wood, this gift is not only useful but will bring a smile to their face whenever it's used. Whether it's finishing off Christmas dinner with a selection of cheeses or being used at any other time of year! Wish a jolly Christmas in a more unique way this year with this bespoke Chilli and Bubble's wooden cheeseboard. Is there a cheese-lover who's worked hard all their life? Give them a gift they'll treasure and use in their years of relaxation with this quirky wooden gift.